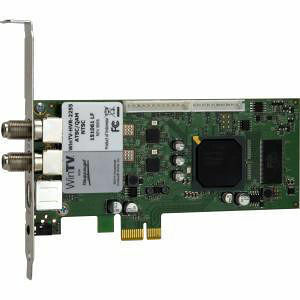 WinTV-HVR-2255 is a PCI Express X1 board based on the NXP 7164 bus interface chip. The WinTV-HVR-2255 contains two tuners with a built-in TV splitter. There is one cable TV or TV antenna connector which is split, providing a video source for both tuners. For ATSC and QAM digital TV, all 18 ATSC formats including 1080i can be watched or recorded to disk as a MPEG-2 Program Stream. The NXP 7164 contains two highly integrated MPEG-1/2 hardware encoders for recording analog cable TV to disk. The playback of the recorded ATSC and QAM digital TV and MPEG-2 encoded analog programs are done through a software MPEG-2 player. WinTV-HVR-2255 now supports an on-board IR receiver and blaster, which can control up to two external set top boxes. With the on-board remote receiver/blaster, you no longer need the external "beanbag" remote receiver. The on-board receiver also has a "learn" mode, so you can use almost any external set top box. Microsoft® Windows® 10, 8, 7 or Vista Premium or Ultimate. Media Center (32 or 64-bit) in Windows 8 or 7. Also for Windows XP.